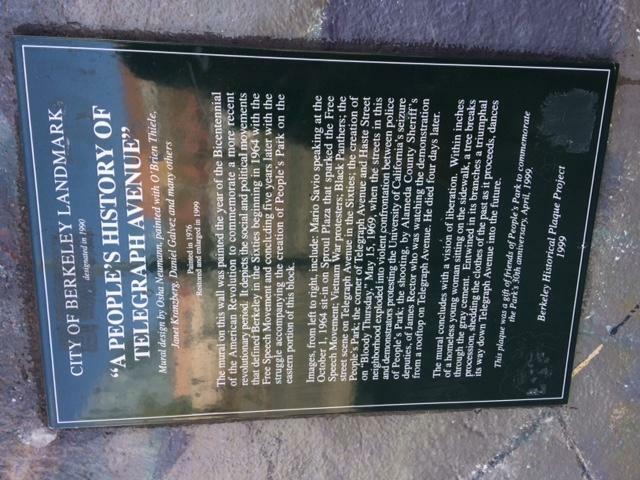 "A People's History of Telegraph Avenue"
designated in 1990The mural on this wall was painted the year of the Bicentennial of the American Revolution to commemorate a more recent revolutionary period. It depicts the social and political movements that defined Berkeley in the Sixties beginning in 1964 with the Free Speech Movement and concluding five years later with the struggle accompanying the creation of People's park on the eastern portion of this block. Images, from left to right, include Mario Savio speaking at the October 1, 1964 sit-in on Sproul Plaza that sparked the Free Speech movement; Vietnam War protesters; Black Panthers; the street scene on Telegraph Avenue in the Sixties; the creation of People's Park; the corner of Telegraph Avenue and Haste Street on ?Bloody Thursday," May 15, 1969, when the streets in the neighborhood exploded in violent confrontation between police and demonstrators protesting the University of California's seizure of People's Park; the shooting, by Alameda County Sheriff's deputies, of James Rector who was watching the demonstration from a rooftop on Telegraph Avenue. He died four days later. The mural concludes with a vision of liberation. Within inches of a homeless young women sitting on the sidewalk, a tree breaks through the gray cement. Entwined in its branches a triumphal procession, shedding the clothes of the past as it proceeds, dances its way down Telegraph Avenue into the future. This plaque was a gift of friends of People's Park to commemorate the Park's 30th anniversary, April, 1999. "In Tribute to Chiura Obata"
This marker can also be identified by its HM code. You can use the hashtag #HM110H in tweets, and any other place where you might refer to this marker, including when searching on this site.